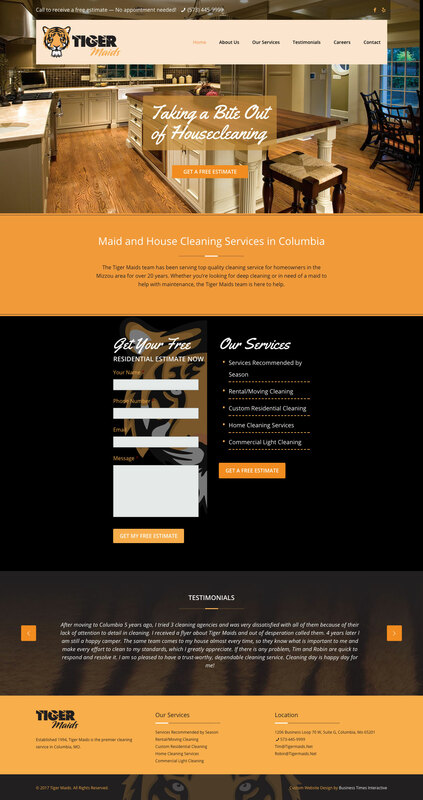 Tiger Maids is a family owned and operated residential cleaning service in Columbia. The owners recognized a need to improve their web presence to generate new leads and to attract qualified job applicants for their thriving business. Tiger Maids was using a different logo on their website, print materials, and signage and also sought to unify their branding. The branding process for Tiger Maids began with a logo redesign. Tiger Maids consistently used tiger imagery and wanted to retain an edgy feel and the black-and-gold colors Columbia loves. CMG wanted to make sure the logo would be unique and would resonate with the key female demographic, avoiding a look that was too aggressive or athletic. CMG achieved the right balance by hand-drawing a serene tiger face and positioning it with bold, heavy text. Tiger-claw slash marks through the lettering added the edginess the client desired, and a script font for “maids” rounded out the feminine appeal. CMG’s web designer created a stunning responsive design for the new TigerMaids.net inspired by the new Tiger Maids logo. The colors salute Columbia’s love of black and gold but differ enough to make the Tiger Maids brand unique. Improved photography showcases Tiger Maids’ core service, and expanded About Us and Meet the Team sections add heart and identity to this family-owned local business. Content was written and organized for the new TigerMaids.net with keyword research and SEO in mind. CMG included strategic calls-to-action throughout the site encouraging visitors to complete a form for free estimates. CMG added a Careers section which Tiger Maids could use to promote open positions and to collect applications and resumes virtually.